Before we proceed to discuss the title of this piece, I’d like to look at three very fundamental questions. Q1. How many brands engage in formal marketing? Almost every single one—from small mom-and-pop stores to global brands— depends on marketing in some form or the other for daily sustenance as well as long-term growth. Q2. How many marketers today are brave enough to stay away from digital marketing? Almost none. Whether B2B or B2C brands, unless they’ve been living under a rock somewhere for the last two decades, digital as a platform is firmly in every marketer’s game plan. Q3. If digital marketing is so ubiquitous, how many marketers are unaware of Search Engine Optimization or content marketing? A lot of people think SEO has been around a lot longer than content marketing is. But if you look at the facts, that’s not really true. The term “content marketing” has gained a lot of cachet in the last five years, but it was first officially used in 1996. In fact Netscape – the forerunner of today’s browsers – actually had a “Director of Online and Content Marketing” way back in 1998. Brands have been using content marketing in the offline world for over a century now with John Deere and its agricultural magazine The Furrow, which launched in 1895. Admittedly, content marketing did get a big boost thanks to SEO and marketers who tried to ‘game the system’ to such an extent that Google had to change tracks on its criteria for search rankings quickly. In 2011, Google’s Panda update on its search algorithm (now in its 4th version) came down hard on spammy SEO practices. It promoted sites with quality, relevant content and penalized sites with little, poor or irrelevant content. This drastic measure made SEOs switch gears from buying links, keyword stuffing and other black-hat practices to jump into creating content and marketing it to push search rankings. On the flip side, there are also stories like Demand Media’s fall from grace when Google penalized content farms that published low quality, irrelevant content that was aimed purely at getting higher rankings on searches or enticing users to ad-filled pages. Traffic to Demand Media owned sites from Google searches fell by 40%, Demand Media’s stock price fell by over 40% within a couple of months of the Panda algorithm change. A clear case of poor content (created purely for SEO and AdSense purposes) leading to penalization by Google. Rand Fishkin says 82% of all the clicks on search results in engines like Google and Bing go to the unpaid, organic results. This number puts in perspective the importance that SEO has in a digital marketer’s armory. Once the user lands on your site, conversion optimization and content helps in converting them into actual leads or customers. 70% of consumers prefer to learn more about brands from articles than from ads. 67% of Twitter users are more likely to buy from the brands they follow online. Corporate sites with active blogs see 55% more visitors than those without. But the fact remains that businesses are driven by profit. Content marketing is mostly being embraced only because of hard ROI data such as the above. SEOs have been known to overdo anything that works. Online directories, forums and web 2.0 blogs, once the mainstay of the internet, were flooded with links by over-eager “SEO guys” eager to make a quick profit, and consequently got devalued by Google, losing their status as authoritative online sources/resources. Content marketing works well at the moment, if done right; however, given the amount of fluff being created every minute, it might break under its own weight, sooner rather than later, as far as Google goes. Marketers will simply move on to the next tactic that works. The black hat ones will call it “staying one step ahead of the algorithm” and the white hat ones will try and “find another channel for digital visibility.” So forget which is more important and focus on creating content which appeals to your audience – it will only benefit your brand in the long run. And to keep Google happy along the way, try following the recommendations given here and here. Chicken and eggs don’t mix in most recipes. In digital marketing, they do. If you read the definitions of each closely, you’ll notice that both SEO and content marketing aim at attracting more and more visitors to a website. Their means to the end may be different, but the final goal remains largely the same. The hard facts mentioned above prove how each of them is hugely important to attracting, converting and retaining customers. If high web traffic that leads to equally high conversions are what both aim at, it is our job as marketers to use each of these tools in such a way that they don’t hinder each other or take away from each other’s processes, but strengthen each other instead. Most organizations have separate teams handling SEO and content marketing – each with their own set of objectives and action plans, often with little or no communication between them, leading to almost silo-like operations. This is a gross under-utilization of the analytical capabilities of SEO and the customer understanding that content marketing brings with it. Allow and encourage communication and cross pollination of ideas between your SEO, PPC and content marketing teams. Better yet, integrate these functions into a common team that shares data, customer insights and works towards a common set of day-to-day goals. Good content will automatically get you eyeballs, right? Wrong. Discoverability of great content on your site depends a lot on how well your site itself is search optimized. Does your site have structured data? Does it block search spiders from browsing through pages that host important content that you want to promote? Are your navigation elements helping discoverability? Is your site built on a good CMS platform that encourages interaction and usability, and is easy to fix or upgrade as per your content needs? The answer to all these questions will be straightforward if you involve your SEO and content teams right when you begin designing and developing the site. Content creation cannot be done in isolation. For the content you create to be effective, you need to understand what drives your target audience. Understand their demographics, their needs, their social interactions, their purchase history, and whatever else you can. A lot of this data is available through social media. Some of it can come from your own registration and other on-site forms. You can actually reach out to customers through survey tools like SurveyMonkey for the rest. Counterintuitive as it may seem, studies show that longer content tends to receive more mentions, inbound links and citations. Neil Patel recommends you aim for 2,000 words to get your content ranked higher in the SERPs. Contentmarketing does not always have to be external to your site. A well designed landing page with useful content or one with a collection of associated pages, all focused on one particular high value product can be a content marketing tool in itself. Shopify’s iPad POS page is a great example of a content marketing led landing page that uses interesting pieces of interactive content to inform users about a product, instead of the usual list of features arranged in boring bullet point format. Content that is created without solid data backing it is just a bunch of stories. Not a marketing tool. Use the Google Keyword Planner and other keyword research tools to figure out which keywords will work for you and which are wastes of time. Browse through Google Analytics and understand your users’ behavior when they are on your site. Which parts of the world do your users come from, which pages have the highest drop off rates, what type of content gets most clicks – all of this data can be put to good use to create relevant, useful and engaging content for your target audience. Go back to your days of SEO 101. Good content is inherently valuable, however GREAT content is born when you integrate SEO fundamentals into it. Don’t host your blog on a separate domain. Let your blog benefit from your website SEO. Put it on the same domain as the rest of your site. Even though Google’s Hummingbird algorithm places a new emphasis on Natural Language Processing and conversational searches instead of purely keyword driven ones, search queries aren’t dead yet. Use terms and phrases that matter to your business wherever applicable inside your content. Just don’t go overboard with keyword stuffing. Google rewards fresh content and ranks it higher than content of similar value but older chronology. Create good content more often to rank consistently high on SERPs. Don’t look down on link-building as SEO spam regardless of what you read on the internet. Matt Cutts recently confirmed that links will influence Google’s algorithm for a long time to come. Cross-link content across your site/blog. This makes sure your older content is still visible to users and can continue to contribute to conversions long after it was created. Share your old content on social networks when you think it’ll benefit new followers or when related topics are trending. Make sure whatever content you create is mobile friendly. The whole idea behind content marketing and SEO is to promote a brand and get higher conversions. However, in an attempt to spew out copious amounts of content with backlinks to their website, many marketers end up creating content that has little or nothing to do with the brand itself or its personality. Don’t make this rookie mistake. Use your content to say more about your brand; increase your brand clout and its salience in the minds of your target audience. Oreo is a prime example of a marque that uses content marketing consistently to expand its brand equity. Content marketers who do not have a SEO frame of mind just cook up something, share it around and hope for the best. If you have a great product, people should be falling over themselves to consume it, right? Well, that might have worked for Henry Ford and the Model T.
In today’s digital marketing scenario, you might have written the next How to Win Friends and Influence People, but if you don’t promote it and distribute it across the right channels, it will simply die an unheralded death. Post your content on your own blog and try to republish, syndicate, or publish associated content on third party blogs. Leverage social media and promote the right type of content (entertainment- or data-driven) on the right networks. Explore paid promotion for on social media or via content delivery networks like Outbrain. See how well your content performs by continuously measuring results. Track organic traffic to your site from sites that carried your content. When you spot content that hasn’t moved the needle in terms of traffic or conversions, go back to the drawing board and start over. Double check your keywords, recreate user personas and then create fresh content that is more targeted and more relevant to your existing and potential customers. While integrating SEO and content marketing does require commitment and co-ordination between various teams, the good news is that many organizations have already recognized the need for this and are doing it already. 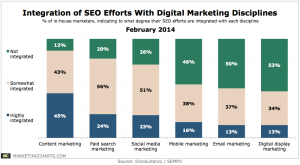 The graph below shows results from an Econsultancy study that shows that 88% of the organizations studied had their SEO and content marketing integrated to some level. You can think of SEO as a part of content marketing and vice versa. Or you could consider them Yin and Yang. Without one, the other is toothless. Content marketing that is supported by robust SEO has the capacity to turbocharge your site traffic and conversions in the short term and customer retention and brand loyalty in the long term. 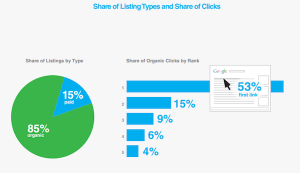 So go ahead, chart your own unique path to attain a balance between the Yin of SEO and the Yang of content marketing, and you’re sure to achieve Branding Zen!